Chroma adds to their 61500/61600 series of programmable AC power sources to include 3kVA, 4.5kVA, and 6kVA single- or three-phase models packaged in a single compact rack mounted chassis. Chroma Systems Solutions announces the addition of three new models to their programmable AC power source product line. The 6150/7/8/9 are programmable up 350VL-N and capable of delivering either single- or three-phase output without derating under SCIP program control. Frequency range includes DC and 15Hz to 2kHz with an option for 5kHz. These models generate sine waveform output with distortions levels below 0.3% at 50/60Hz. Chroma 61500/61600 series AC power sources have built-in 16-bit measurement circuits and firmware utilities to measure true RMS voltages, currents, true powers, apparent powers, reactive powers, power factors, current crest factors, repetitive peak currents, and inrush currents. Using an DSP technology, the 61500 can measure THD and up to 50 orders of current harmonics. The series can simulate power line disturbances (PLD) by LIST, PULSE, and STEP modes. The STEP and PULSE modes may be triggered by internal or external events and allows for simulation of disturbances such as cycle dropouts, transient spikes, brown outs, etc. The LIST mode extends this function for more complex waveforms up to 100 sequences with different start-end conditions. 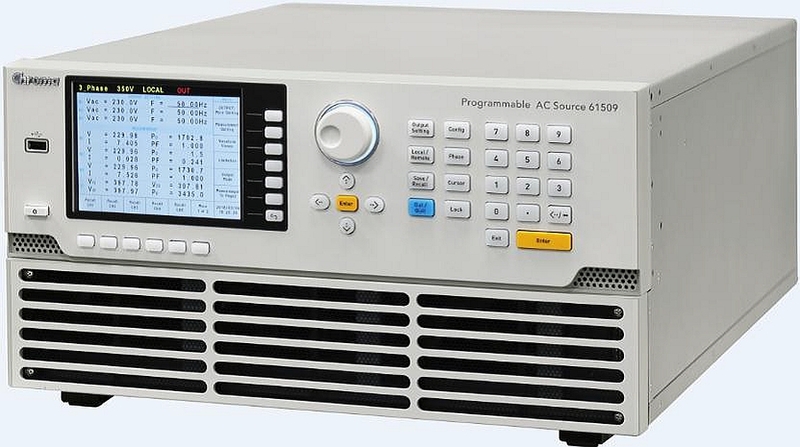 The 61500 is capable of simulating voltage dips, interruptions, and variation waveforms for IEC 61000-4-11 pre-compliance tests and IEC61000-4-14/IEC61000-4-28 compliance tests. IEC 61000-4-13 standards require inter-harmonic simulations as well as harmonic waveforms. The Chroma 61500 addresses this standard by allowing users to compose different harmonic components to synthesize various harmonic and distorted waveforms. Applying this feature, users can program sweeping frequency components with the fundamental voltage to find the resonance points of the UUT, providing users with in-depth analytical results. The slew rate settings for changing voltage and frequency are user programmable. The 61500/61600 will follow the slew rate used to reach the final settings when the output voltages or frequencies are changed. This function helps users verify the operating range of input power by sweeping voltage gradually instead of measuring in steps. In order to reduce the inrush current during motor startup or UUT power-up, users can decrease the slew rate setting to minimize peak current demands. The 61500/61600 programmable AC source can be paralleled to increase power output. The front panel 5.7″ color LCD display provides users easy programming with voltage and current measurement waveforms. GPIB, RS-232, USB, and Ethernet interfaces are available to control the AC source remotely.